These scenic helicopter flights provide you with a bird's eye view of the snowy Canadian Rockies in the winter time giving you plenty of opportunity to take great photos! Helicopter flights start at 8:30am and depart from the Canmore Base, which is located just15 minutes drive out of Banff. We can help you with your transportation from Banff if you require it. Reach areas only accessible by helicopter to avoid the crowds and get some fresh tracks! 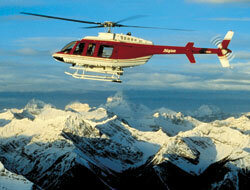 View our Banff Heli-Sking page for details!